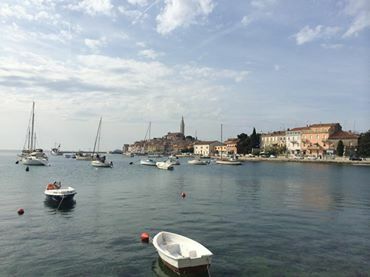 In just over 16 hours, the seaside town of Rovinj will play host to the world’s fastest motor sport; the second round of the Red Bull Air Race World Championship has arrived in Croatia. The first race, which took place in Abu Dhabi, showed the world what a combination of cutting edge engineering and world-class piloting makes possible. Paul Bonhomme won the race in record time, and the next closest finishers trailed by mere fractions of a second. The tight grouping is a testament to the racers’ skills, but also reflects new rules put in place for the 2014 Air Race series. This year, for the first time ever, the pilots are using a standardized propeller and engine combination. The specially designed composite propeller, nicknamed “The Claw,” was created by Hartzell to take performance aviation to the next level. The blade’s carbon fiber technology keeps it unprecedentedly light, while maintaining an incredibly thin blade, a thick cord width and durability. The Claw is a the culmination of radical advances in composite engineering, designed to increase performance and safety. In addition to our steadfast support for all the racers, Hartzell is sponsoring Michael Goulian’s race team. We are looking forward to seeing him put up some fantastic times this weekend. The Hartzell team wishes all the racers good luck. We love seeing our precision composite propellers put to the ultimate test. #SmokeOn! The final rounds of the race in Rovinj can be viewed live on Red Bull TV at 10am on Sunday, April 13th. If you miss it, don’t worry. We will have a recap of all the excitement on Monday, and you can see updates from the team in Croatia on our Facebook page.